This play contains graphic violence. Running time is 95 minutes with no intermission. (Providence) It didn’t look like a good setup for good theater. 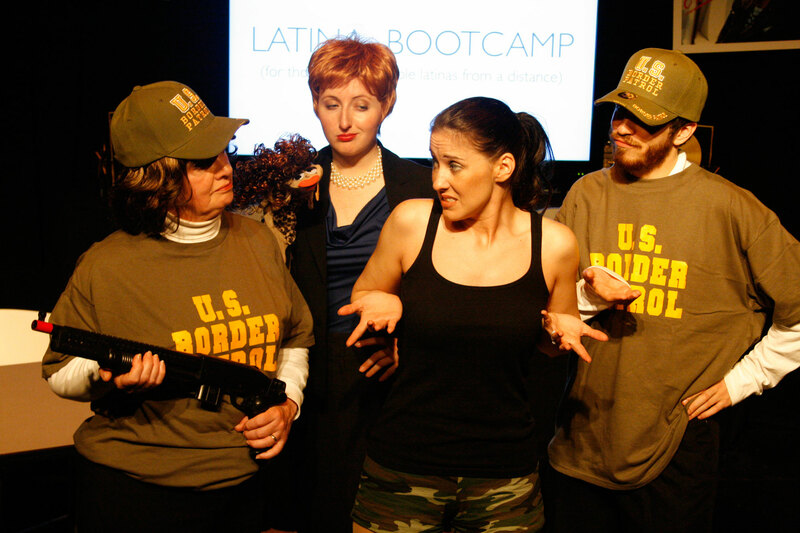 Post-apocalyptic zombie invasions have become all the rage for script-writers, and there have been several new plays in Boston which have attempted to turn flesh-eating marauders into viable drama; few have been successful. The best resembled family dramas with zombies tacked on; the worst became fan fiction. Trinity Rep resident company members Phyllis Kay (Caroline) and Janice Duclos (Wilma) in The Mourners’ Bench, a world premiere by George Brant, directed by Michael Perlman. Now playing at Trinity Repertory Company as part of the Three by Three in Rep. Sets by Michael McGarty, Costumes by William Lane, Lighting by Dan Scully. Photo by Mark Turek. 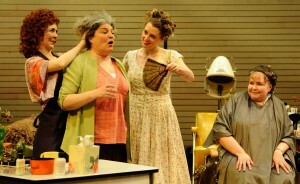 The Mourner’s Bench by George Brant, Trinity Repertory Company, 3/7/12-5/24/12, http://www.trinityrep.com/on_stage/current_season/mb.php. (Pawtucket, RI) Every creation story has a few holes in it, be it the Big Bang or the Garden of Eden. (I will now pause for defenders of said creation stories to get snippy.) But few creation stories have holes as absurdly funny as in the play Boom, which is now playing at the Gamm Theatre in Rhode Island. 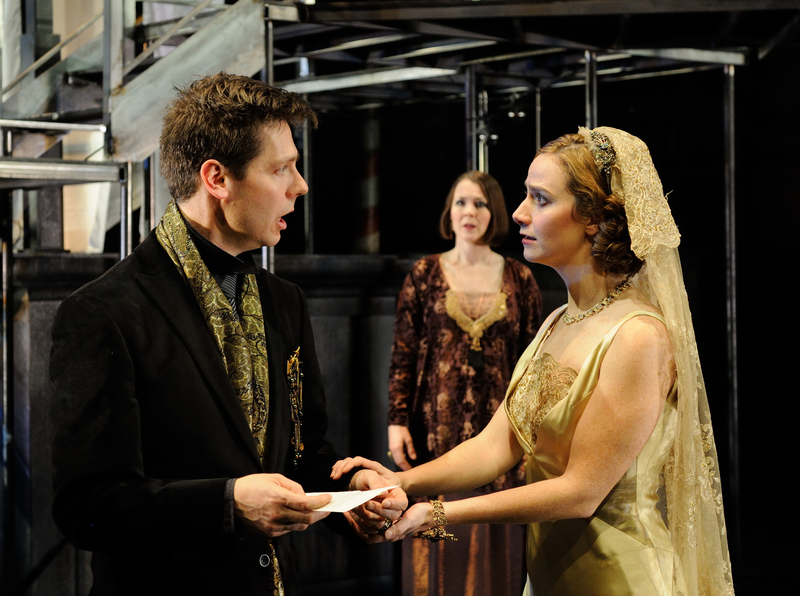 (L to R) Trinity Rep resident company members Stephen Thorne, Rachael Warren and Brown/Trinity Rep MFA actor Mary C. Davis in The Merchant of Venice at Trinity Rep. A bold new setting brings to light the timelessness of Shakespeare’s controversial play. Directed by Artistic Director Curt Columbus, the show runs through March 11 in the Chace Theater. 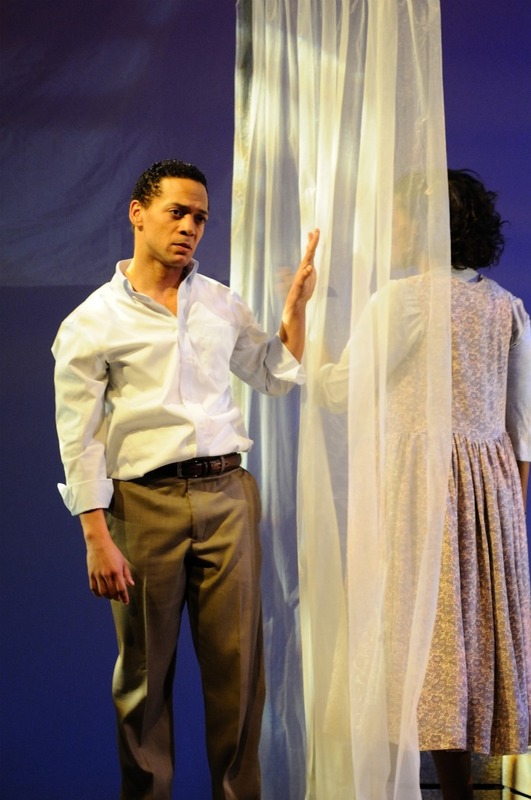 Set Design by Eugene Lee, Costume Design by Olivera Gajic, Lighting Design by Keith Parham. Photo by: Mark Turek. The Merchant of Venice by William Shakespeare, Trinity Repertory Company, 2/3/12-3/4/12, http://www.trinityrep.com/on_stage/current_season/TN.php. (Providence, RI) . The Merchant of Venice is one of Shakespeare’s most difficult plays but also one of his most satisfying. Shakespeare’s play examines the intricacies of love, loyalty, and ethics among the citizens of Venice. 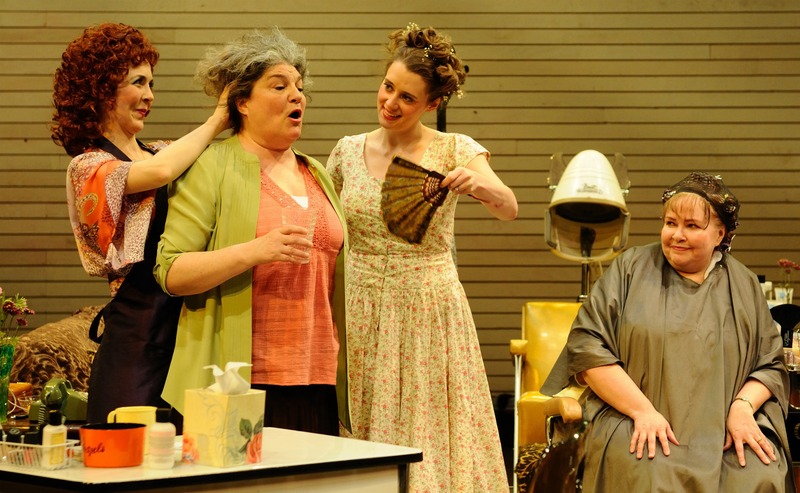 Trinity Rep’s current production provides a clear straightforward rendition of the tale. 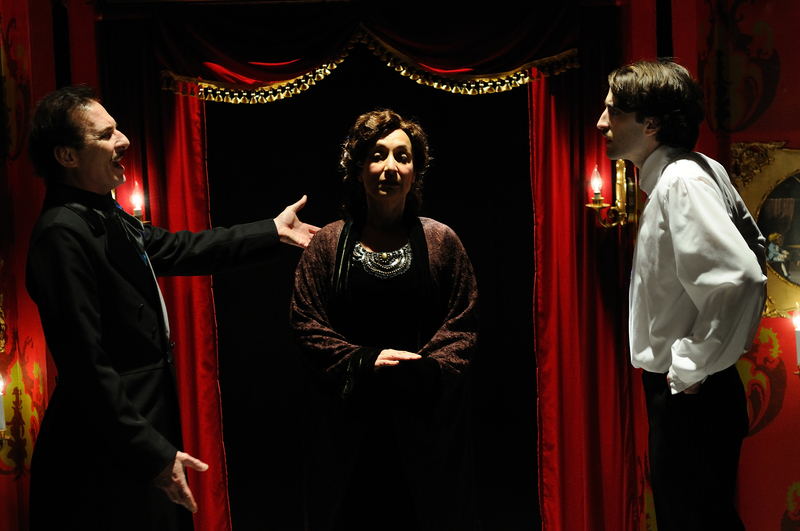 (L To R) Resident acting company members Brian McEleney and and Phyllis Kay with Brown/Trinity Rep MFA ’12 actor Charlie Thurston as Young Edgar Poe.in the world premiere of Stephen Thorne’s The Completely Fictional – Utterly True – Final Strange Tale of Edgar Allan Poe. 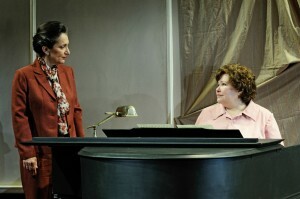 Set Design by Susan Zeeman Rogers, Costume Design by William Lane and Lighting Design by Keith Parham. Photo by Mark Turek. The Completely Fictional-Utterly True-Final Strange Tale of Edgar Allan Poe by Stephen Thorne, Trinity Repertory Company, Dowling Theater, 5/6/11-6/11/11, http://www.trinityrep.com/on_stage/current_season/ST.php. 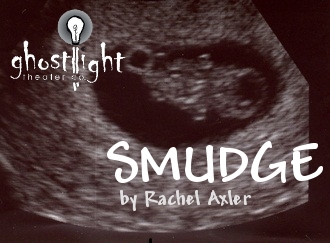 Something delightfully macabre is happening at Trinity Rep. Even Edgar Allan Poe is beside himself–literally. Stephen Thorne spins an atmospheric tale that combines true facts, speculation, and gothic fiction in his new play The Completely Fictional-Utterly True-Final Strange Tale of Edgar Allan Poe. Trinity Rep’s world premiere entices the senses, questions reality, questions meaning, and ushers in a new form of ghost story.